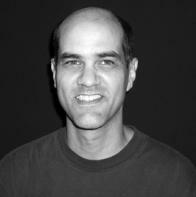 Bob Hicok teaches creative writing at Virginia Tech University. His books include The Legend of Light, (1995) Plus Shipping (1998), and Animal Soul (2001), which was a finalist for the National Book Critics Circle Award. He has published two other books — Insomnia Diary (2004) and This Clumsy Living (2007), both with the University of Pittsburgh Press. His poems have appeared in The New Yorker, Poetry Magazine, The Paris Review and The American Poetry Review, as well as four volumes of The Best American Poetry. Awarded a Guggenheim Fellowship in 2008 and an NEA Fellowship in 1999, his work has also been reprinted three times in the Pushcart Anthology. from the headwaters of the Mississippi. is needed, men cut palms and shake hands. feel less meaning. "Shived in the brain,"
and clear, just long enough to let go. She'd come a long way to applaud. as if to say, why do you bother me? to feel your private weather more deeply. When my moustache awoke, it didn't know who it was. The nurse assured me this would change. when I say hello, he thinks I'm talking to him. I hear my hair scream when I shave. So I hum. on the highway, wind-tunnel ahead. more fun in the open. A piece of pie and a gun on the table. who is and is not a child. unheard. Next time, he tells me, no pie. and ugly, fat and midwestern and ugly. praying for me to break the surface of the water. if there's hope for me yet. Shall we be innocent of banging on the pipes? we're adamant about. But not this potato-salad. can you honestly say "The Department of Commerce"
how they don't go down without a fight? oooh or aaah as you go flashing by. that I know of, so we have to share.